Sixty-five years or so ago when he was living in Russell County, Kansas, Loren Lederhos collected shark teeth from the river gravel that was used to pave roads and parking around the small town of Gorham. The gravel was taken from sandpits along the Smoky Hill River and other streams where it had accumulated for millions of years as the river eroded its way down through the Smoky Hill Chalk and earlier Cretaceous rocks in the western part of the state. I recently had the opportunity to examine a collection made by Lederhos about 1940. Finding sharks teeth in these gravel deposits represents an unusual occurrence because the teeth actually originated in much older rocks. While these Cretaceous rocks in Kansas range from about 100 million to 82 million years old, the gravel deposits in which they occur may be less than a million years old. The Cretaceous rocks were once a part of the bottom of a vast inland sea that covered most of the middle of North America. 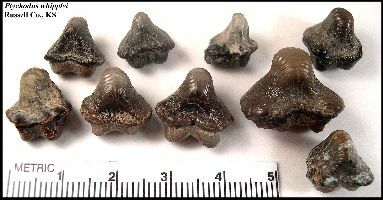 As the softer rocks were eroded away by streams flowing from the west, some of the fossils contained in them, including sharks teeth, were weathered out, transported downstream and mixed with a huge mass of sand and gravel that had originated further west in the Rocky Mountains of Colorado. As the fossil teeth were tumbled along with the flowing water, they were ground against harder rocks (quartz, etc) and were slowly broken and worn down. Sometimes, however, they were buried in gravel bars along the way and protected from further damage. The sharks teeth found by Loren in these gravel deposits represent the mixture of several species that lived at different times over period of nearly 20 million years. The Lederhos collection is interesting because it also shows us which teeth were "survivors." The collection exhibits a bias toward larger teeth because those are the teeth that were most visible to the collector and, more importantly, robust enough to survive the process of erosion and transport through the rivers in western Kansas. That is why Ptychodus is "over-represented".... crusher shark teeth are more compact and are already rounded to some extent compared to the thin edges, pointed cusps and exposed roots found on Cretoxyrhina and Squalicorax, and suffer less damage. 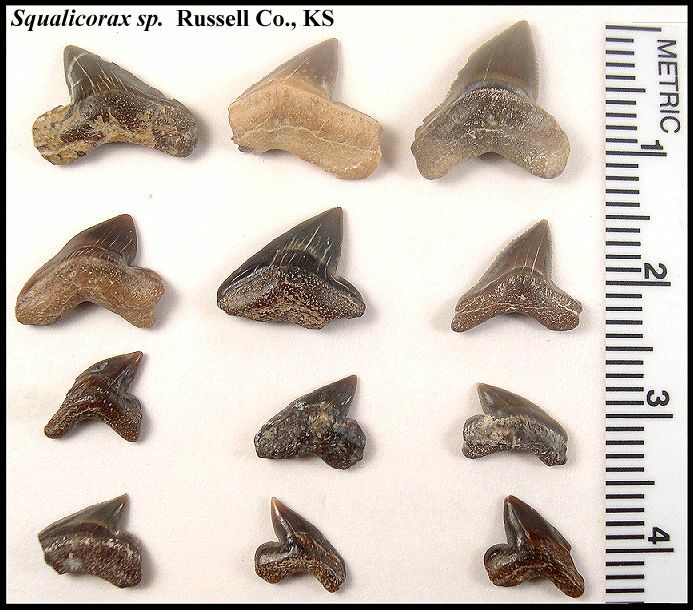 As a comparison, a similar sample of 461 shark teeth surface collected from a site in the lower Smoky Hill Chalk in Trego County was 71% Squalicorax and only 5% Ptychodus. 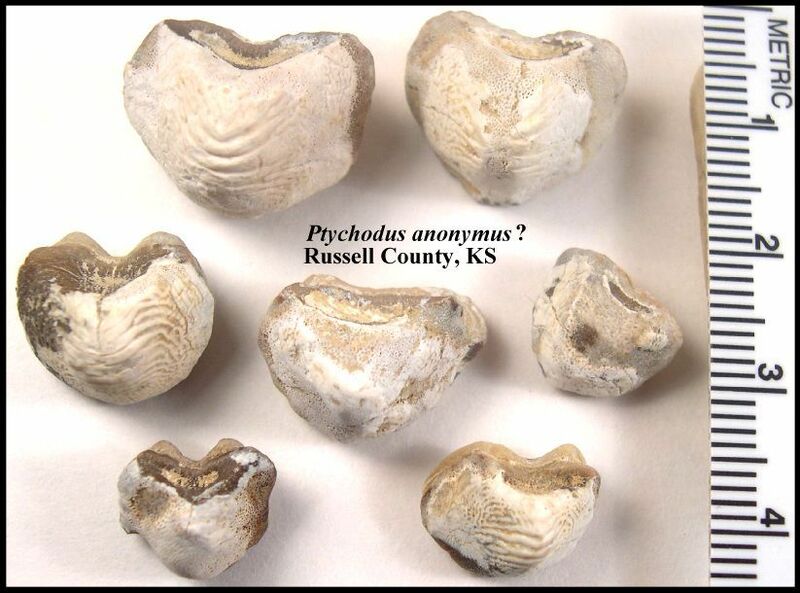 Similar percentages occur in other collections made directly from specific formations in the Cretaceous of Kansas. The reader is referred to my Sharks of Kansas webpage for more information regarding the occurrence of these sharks. Similar mixed and unassociated collections shark teeth are made from a site called Big Brook in New Jersey and the North Sulphur River in Texas. 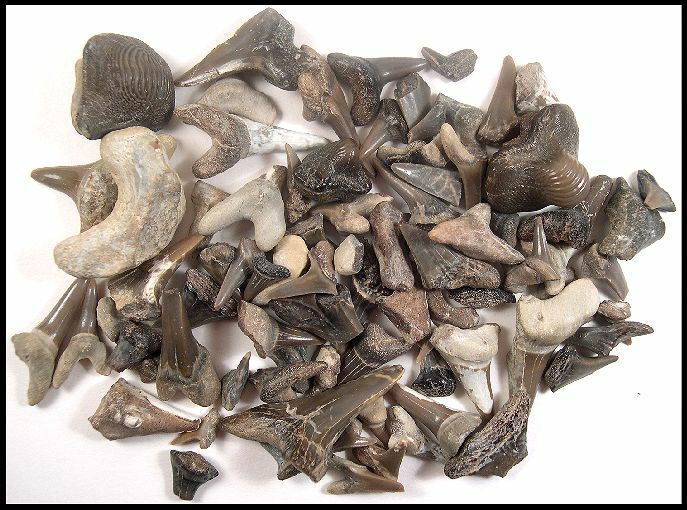 LEFT: Ptychodus whipplei was the most common (33 teeth) of the crusher shark teeth in the sample. This species occurs most frequently in the basal Greenhorn Limestone (Upper Cenomanian). 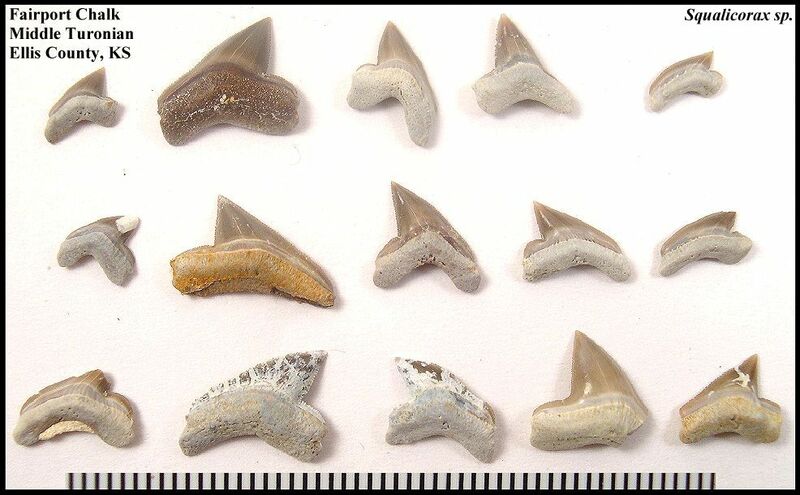 About 1/3 of the Ptychodus teeth examined (35) were too small or too badly damaged to be reliably identified. LEFT: A group shot of some of the larger and better preserved P. whipplei teeth in lingual view. The tall central portion of the crown with its near vertical sides is a key feature used to identify these teeth. 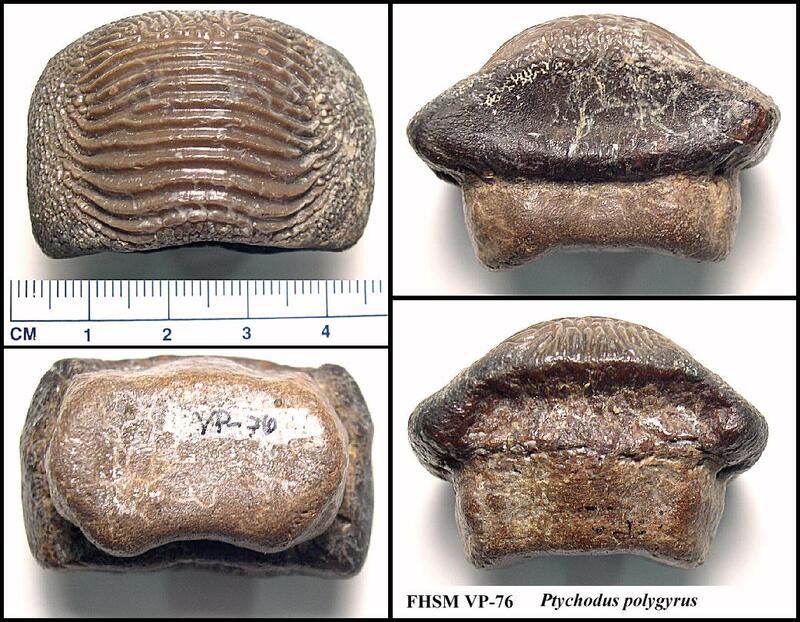 It was proposed by Meyer (1974) that Ptychodus whipplei, P. mammillaris and P. anonymus represent a chronospecies. 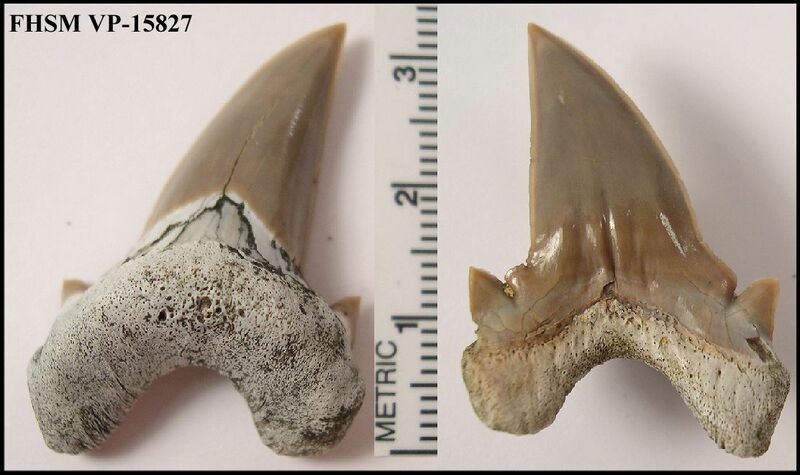 LEFT: Ptychodus mammillaris was the second most common (20 teeth) crusher shark in the sample. This species is known to occur from the Greenhorn Limestone up to the base of the Fort Hays Limestone. See Shimada and Everhart (2003) and Everhart and Darnell (2004) for additional information on this species. 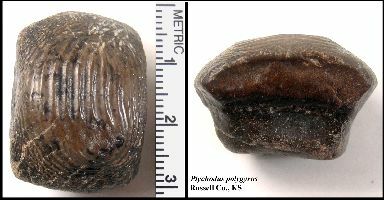 Photo of P. mammillaris tooth (FHSM VP-14022) from the basal Fort Hays Limestone. 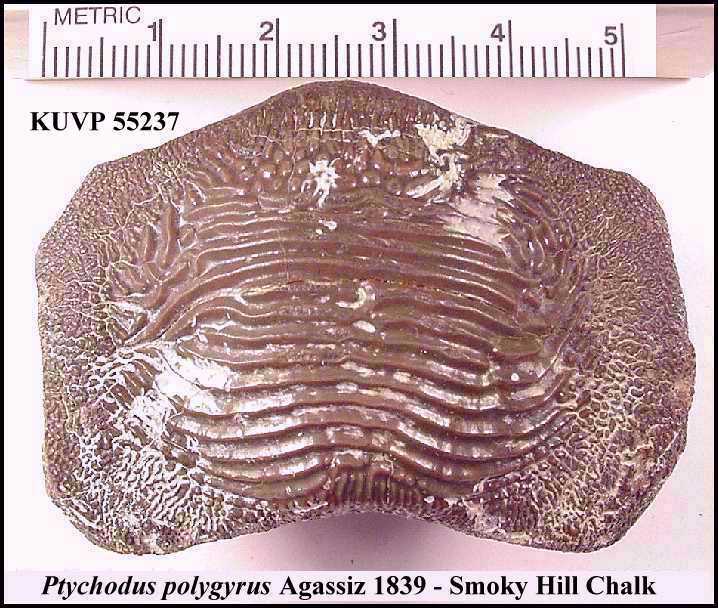 LEFT: Ptychodus mortoni is a rare and unusual occurrence below the Smoky Hill Chalk (Upper Coniacian). This tooth could have been carried in from the Smoky Hill Chalk, but seems to be in very good shape to have tumbled along a stream bed for that many miles. 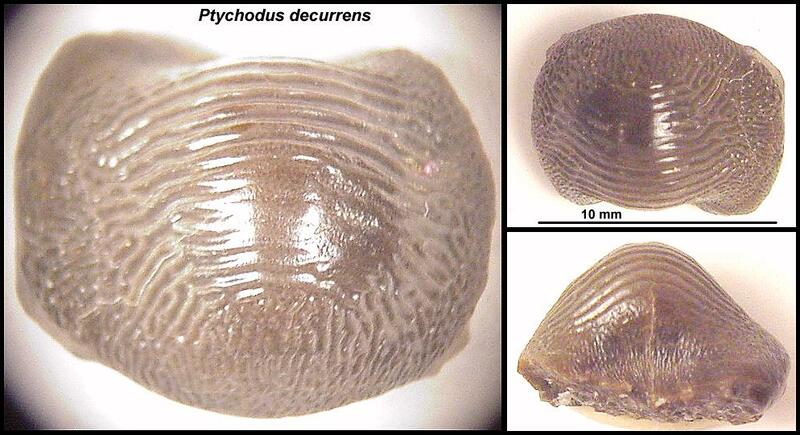 For more information regarding this species, see my Ptychodus mortoni webpage. 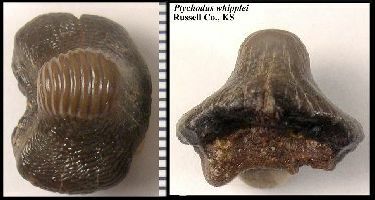 LEFT: These badly worn teeth are most probably Ptychodus anonymus and appear to share similar patterns of weathering and erosion. For more information on P. anonymus, see Everhart and Caggiano (2004). LEFT: This group of Squalicorax sp. teeth includes S. falcatus, S. curvatus and possibly S. volgensis. As a group, however, most of the 44 Squalicorax teeth in the collection were too damaged to be identified reliably. LEFT: This large and very battered tooth is most likely from a big shark called Cretodus. If so, this specimen is probably among the oldest teeth in the sample. 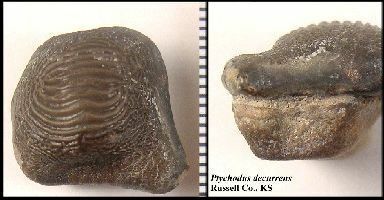 A Cretodus semiplicatus tooth from the Dakota Sandstone (Middle Cenomanian) of Russell County. LEFT: At least some of these fairly robust teeth are probably from a recently identified, "new" genus of sharks from Kansas - Cardabiodon. These teeth are sometimes confused with those of Cretoxyrhina. Here is a specimen collected in June, 2005, by Keith Ewell from the Lincoln Limestone Member of the Greenhorn Limestone. The genus was originally described from Australia by Mikael Siverson, and then more recently from Montana by Siverson and Lindgren. LEFT: One of the rarer species identified in the sample is Scapanorhynchus raphiodon, a species possibly related to the modern Goblin shark. These tiny teeth are also unusual for just being able to survive long enough to be collected! The presence of some original matrix on the teeth may also indicate that they were surface collected from an outcrop. Here is a nice specimen that I collected recently from the lower Smoky Hill Chalk in Trego County. 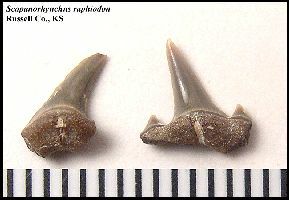 LEFT: Cretalamna appendiculata was rare in the sample (3 teeth). Although relatively rare at all stratigraphic levels in the Kansas Cretaceous, Cretalamna occurs consistantly through the Cretaceous stratigraphic column in Kansas and apparently survives the extinction at the end of the Cretaceous. 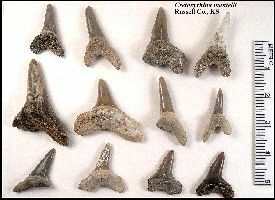 LEFT: Cretoxyrhina mantelli were the most common (72 teeth) shark teeth in the sample. Cretoxyrhina was a very large lamniform shark (6+ m). The species has been documented in Kansas from the Middle Cenomanian (Dakota Sandstone) through the Lower Campanian (Smoky Hill Chalk) after which it appears to have become extinct. See other specimens here. Caggiano, T. and M. J. Everhart, 2003. A rare occurrence of the Late Cretaceous ptychodontid shark, Ptychodus polygyrus Agassiz 1839, in the Smoky Hill Chalk Member (Niobrara Formation) of western Kansas. Kansas Acad. Science Abstracts, 22:28. Cope, E. D., 1875. The vertebrata of the Cretaceous formations of the West. Report, U. S. Geol. Surv. Terr. (Hayden). 2:302 p, 57 pls. Everhart, M. J. and Caggiano, T. 2004. An associated dentition and calcified vertebral centra of the Late Cretaceous elasmobranch, Ptychodus anonymus Williston 1900. Paludicola, 4(4), p. 125-136. Everhart, M. J., T. Caggiano and K. Shimada. 2003. 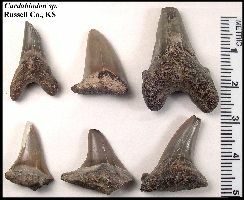 Note on the occurrence of five species of ptychodontid sharks from a single locality in the the Smoky Hill Chalk (Late Cretaceous) of western Kansas. Kansas Acad. Sci. Abstracts, 22:29. Everhart, M. J. and P. A. Everhart, 1998. New data regarding the feeding habits of the extinct lamniform shark, Cretoxyrhina mantelli, from the Smoky Hill Chalk (upper Cretaceous) of western Kansas. Kansas Acad. Sci. Trans. 17:(Abstracts)33. Hamm, S. A. and M. J. Everhart, 1999. 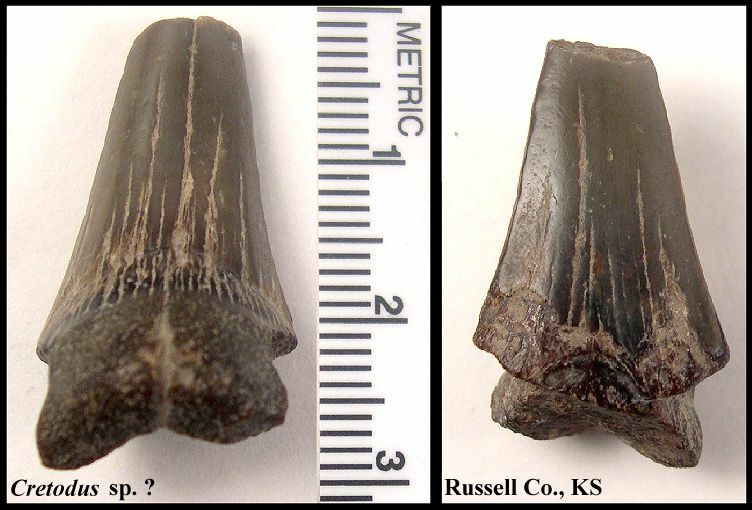 The occurrence of a rare Ptychodontid shark from the Smoky Hill Chalk (upper Cretaceous) of Western Kansas. Kansas Acad. Sci. Trans. 18(Abstracts):34. Hamm, S. A. and K. Shimada. 2002. 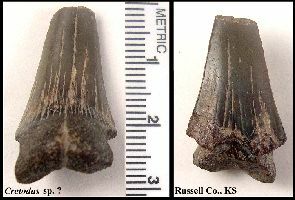 Associated tooth set of the late Cretaceous lamniform shark, Scapanorhynchus raphiodon (Mitsukurinidae), from the Niobrara Chalk of Western Kansas. Kansas Acad. Sci. Trans. 105(1-2)18-26. Hamm, S. A., K. Shimada and M. J. Everhart, 2003. 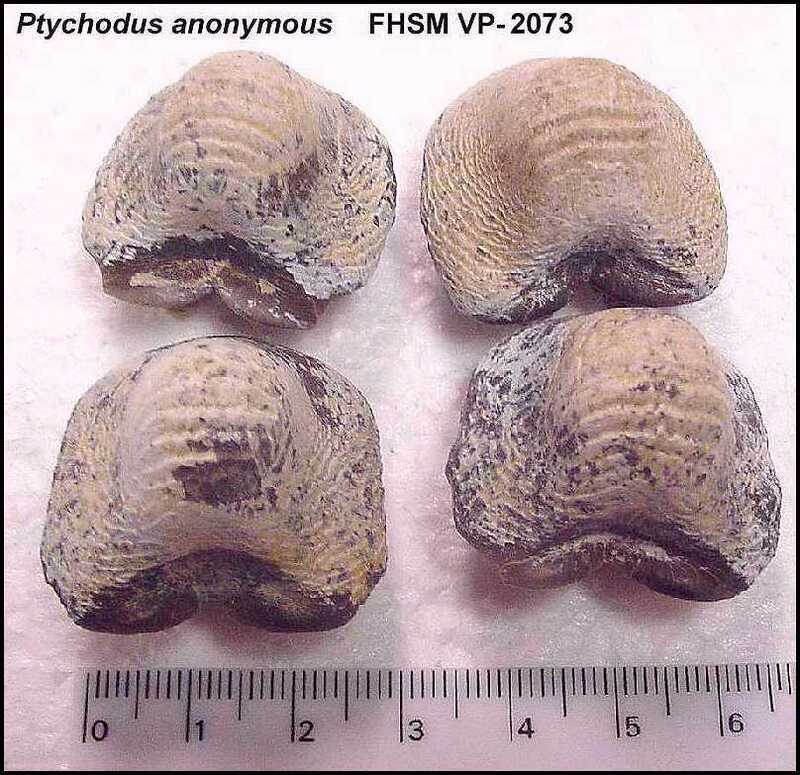 Three uncommon lamniform sharks from the Smoky Hill Chalk (Upper Cretaceous) of western Kansas. Kansas Academy of Science Abstracts, 22:30-31. Hattin, D. E., 1962. Stratigraphy of the Carlile Shale (Upper Cretaceous) in Kansas. State Geol. Surv. of Kansas, Bull. 156, (University of Kansas pub.) 155 p. 2 pl. Hattin, D. E., 1965. Stratigraphy of the Graneros Shale (Upper Cretaceous in central Kansas. Bulletin 178, Kansas Geological Survey, 83 pp. Hattin, D. E., 1975. Stratigraphy and depositional environment of the Greenhorn Limestone (Upper Cretaceous) of Kansas. Bulletin 209, Kansas Geological Survey, 128 pp. Hattin, D. E., 1982. Stratigraphy and depositional environment of the Smoky Hill Chalk Member, Niobrara Chalk (Upper Cretaceous) of the type area, western Kansas. Kansas Geological Survey Bulletin 225, 108 pp. Meyer, R. L. 1974. Late Cretaceous elasmobranchs from the Mississippi and East Texas embayments of the Gulf Coastal Plain. Unpublished Doctoral dissertation, Southern Methodist University, Dallas, 419 pp. Mudge, B. F. 1876. Notes on the Tertiary and Cretaceous periods of Kansas. Bull. U.S. Geol. Surv. Terr. (Hayden), 2(3):211-221. Russell, D. A. 1988. A check list of North American marine cretaceous vertebrates Including fresh water fishes, Occasional Paper of the Tyrrell Museum of Palaeontology, (4):57. Schultze, H.-P., J. D. Stewart, A. M. Neuner and R. W. Coldiron. 1982. Type and figured specimens of fossil vertebrates in the collection of the University of Kansas Museum of Natural History. Part I. Fossil fishes. Misc. Pub. Univ. Kansas Mus. Nat. Hist. 73:53 pp. Scott, R. W. 1970. Paleoecology and paleontology of the Lower Cretaceous Kiowa Formation, Kansas. The University of Kansas Paleontological Contributions, Article 52, 94 pp. Shimada, K. 1993. 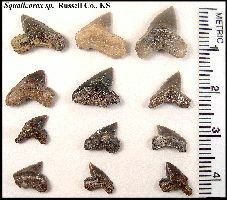 Upper Cretaceous elasmobranchs from the Blue Hill Shale Member of the Carlile Shale, Western Kansas. Kansas Academy of Science Abstracts, 12(78). Shimada, K. 1993. Upper Cretaceous selachians from the Fort Hays Limestone Member of the Niobrara Formation in Ellis County, Kansas. Kansas Academy of Science Abstracts, 12(78). Shimada, K. 1994. Paleobiology of the Late Cretaceous shark, Cretoxyrhina mantelli (Lamniformes: Cretoxyrhinidae), from Kansas. Unpubl. Masters thesis. 169 pp. Fort Hays State University. Shimada, K. 1996. Selachians from the Fort Hays Limestone Member of the Niobrara Chalk (Upper Cretaceous), Ellis County, Kansas. Kansas Acad. Sci. Trans. 99(1-2):1-15. Shimada, K. 1997a. Dentition of the late Cretaceous lamniform shark, Cretoxyrhina mantelli, from the Niobrara Chalk of Kansas. Journ. Vert. Paleon. 17(2):269-279. Shimada, K. 1997b. Shark-tooth-bearing coprolite from the Carlile Shale (upper Cretaceous), Ellis County, Kansas. Kansas Acad. Sci. Trans. 100(3-4):133-138. Shimada, K. 1997c. Stratigraphic record of the late Cretaceous lamniform shark, Cretoxyrhina mantelli (Agassiz), in Kansas. Kansas Acad. Sci. Trans. 100(3-4):139-149. Shimada, K. 1997d. 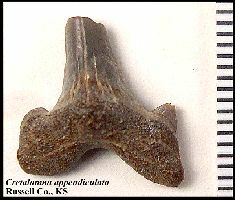 Gigantic lamnoid shark vertebra from the lower Cretaceous Kiowa Shale of Kansas. Journ. Paleon. 71(3):522-524. Shimada, K. 1997e. Paleoecological relationships of the late Cretaceous lamniform shark, Cretoxyrhina mantelli (Agassiz). Journ. Paleon. 71(5):926-933. Shimada, K., 1997f. Periodic marker bands in vertebral centra of the late Cretaceous lamniform shark, Cretoxyrhina mantelli. Copeia (1):233-235. Shimada, K. 2005. Skeletal and dental anatomy of the Late Cretaceous lamniform shark Cretalamna (= Cretolamna) appendiculata. Journal of Vertebrate Paleontology 25 (Supplement to 3):114A-115A. Shimada, K. and Cicimurri, D.J. 2005. Skeletal anatomy of the Late Cretaceous shark, Squalicorax (Neoselachii: Anacoracidae). Paläontologische Zeitschrift 79(2): 241-261. Shimada, K. and D. J. Martin. 1993. 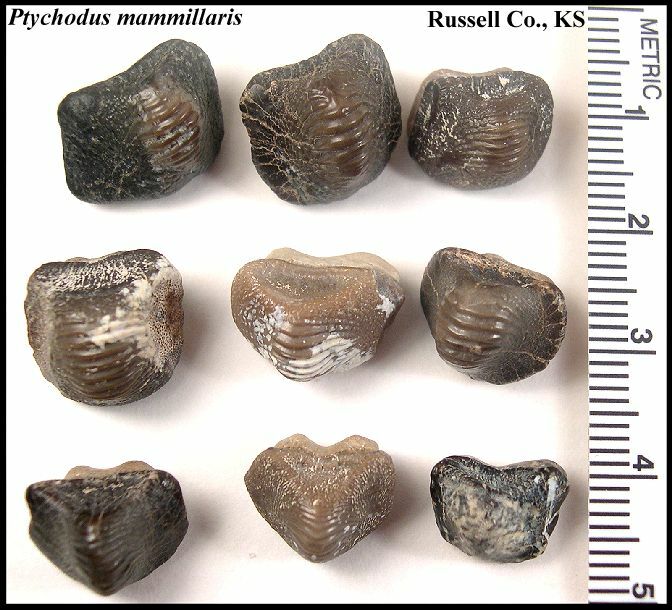 Upper Cretaceous selachians from the basal Greenhorn Limestone in Russell Co., Kansas. Kansas Academy of Science Abstracts, 12(78). Siverson, M. 1999. A new large lamniform shark from the uppermost Gearle Siltstone (Cenomanian, Late Cretaceous) of Western Australia. Transactions of the Royal Society of Edinburgh: Earth Sciences, 90:49-66. Siverson, M. and J. Lindgren. 2005. Late Cretaceous sharks Cretoxyrhina and Cardabiodon from Montana, USA. Acta Palaeontol. Pol. 50(2) 301-314. Stewart, J. D. 1990. 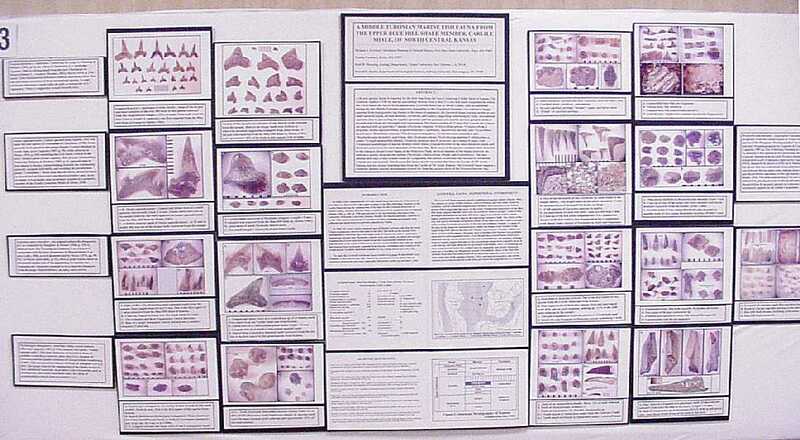 Niobrara Formation vertebrate stratigraphy, pages 19-30, In Bennett, S. C. (ed. ), Niobrara Chalk Excursion Guidebook, The University of Kansas Museum of Natural History and the Kansas Geological Survey. Welton, B. J. and R. F. Farish. 1993. The collectors guide to fossil sharks and rays from the Cretaceous of Texas. Horton Printing Company, Dallas, 204 pp. Williston, S. W. 1900. Cretaceous fishes [of Kansas]. Selachians and Pycnodonts. Univ. Geol. Surv. Kansas VI pp. 237-256, with pls.